Despite the difference in color, each version of the Xros Loader toy has the same exact Digimon available. Form teams with the Digimon you have gathered and battle with friends through infra-red. 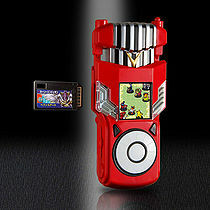 With its built-in voice recognition system, you can obtain Digimon via different sounds. 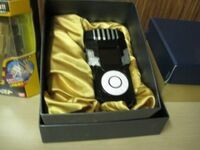 Summon legendary Digimon with "DigiMemories", a form of memory card. Can store up to 50 MP3s. Features connectivity with the Digimon Xros Arena. 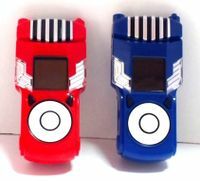 DigiMelodies may be used to obtain specific Digimon. Press the center button to start the sound scanning at the same time you play the DigiMelody for best results. In this mode, you travel through different Zones, doing battle and playing minigames in order to clear the Zone’s area. When you select a space on the Zone Map, there are three different outcomes. Battle: Fight and defeat the leader of that area. On the first turn of the battle, you attack with your subordinates (maximum of three at once). On the second turn, you attack with your leader Digimon. The opposing leader may not be attacked if it has three subordinates out in front of it. Release a DigiXros – Armament DigiXros. Battle: Battle with another Xros Loader. Trade: Trade Digimon with another Xros Loader. Leader (リーダー): directly attacks the enemy Leader Digimon. Refrain (ひかえ): attacks a random spot in the enemy reserve. Left and Right (さゆう): attacks the left and right front line Digimon. Laze (なまける): fails to attack. Recovery (かいふく): heals the Leader Digimon. Avoid (かいひ): dodge an enemy attack. Guts (こんじょう): survive any attack with 1HP remaining. Guard (ガード): reduces damage from an attack. Critical (クリティカル): doubles Attack Power for that turn. Direction (ほうこう): Increases all Ally Digimon's Attack Power. Field (フィールド): Increases all Ally Digimon's Defense Power. Recovery (かいふく): Heals all front line Ally Digimon. Big Recovery (大かいふく): Heals all reserve Ally Digimon. Resurrection (ふっかつ): Revives one random Ally Digimon. Sacrifice (いけにえ): Sacrifices one reserve Ally Digimon to increase the Leader's Attack Power. Fusion DigiXros: These are the Digimon that can appear via Digixros, all consisting of a leader and several subordinates. The leader necessary for it will be listed first. Armament DigiXros: This refers to Digimon who make weapons and items when Digixrossed, as well as Digimon who have the ability to change as such on their own. New Digimon can be added to the Digimon List by listening to certain sound files, usually a DigiMelody. For officially released DigiMelodies, the functioning part of the DigiMelody is usually a string of about three notes at the beginning of the file, while the rest is simply for entertainment. Examon: Clean all 12 Zones and reload. Metal Garurumon: Surpass 100 battles and reload. War Greymon: Surpass 200 battles and reload. Omegamon: Bring Shoutmon, Greymon and SkullKnightmon up to the maximum level (20) and reload.